area for local children at the Regeneration Centre, the first play facility on the Estate in years. “village centre” on land at the centre of the Estate. The facilities could include a healthy living WORKJ.\G TOGETHER TO CREATE A BETTER FUTURE. centre, college, offices, shops and a police station. In February, Winner – the two- year-old women’s project – moved into larger accommodation on Preston Road. 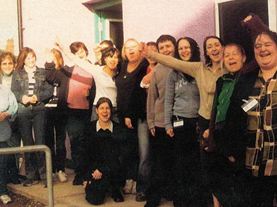 The Centre had a team of 30 staff and volunteers. March: The European Social Fund awarded PRNDC £546,000 to help fund nearly 100 job opportunities in IT, construction, catering retail and administration.